London - South Africa's Sifiso Nhlapo failed to progress past the quarter-finals of the BMX racing at the London Olympic Games on Thursday. 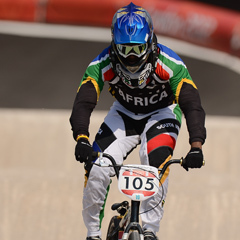 Nthlapo, a finalist at the 2008 Beijing Games, finished in a disappointing 8th place with 27 points in Heat 4 of the BMX event. He was tipped as a strong contender for a medal after he crashed out of the final four years ago and seemed to play it safe this time around. "I made it pretty hard for myself and like I said, it was the top 32 guys in the world and it was going to be hard from the get-go," Nhlapo said. "I just managed to stay safe, but this weekend staying safe isn't enough," Nhlapo said. "I've been through so much the past four years. I've kind of learnt from my mistakes and I can sort of see something happens before it does." While Nhlapo was the epitome of consistency, finishing fifth place in three of his runs and sixth in the other two, it was not good enough to secure a spot in Friday's semi-final. He, however, did well to stay out of harms way on three occasions where competitors crashed in front of him, with Nhlapo having to manoeuvre his way through the chaos. In his second last run, Zabala Oquendo of Colombia crashed in front of the South African on the last bend, with Nhlapo doing well to avoid the fallen biker. The 25-year-old also said the odds would always be stacked against him riding against defending Olympic champion Maris Stromsberg of Latvia and world champion Sam Willoughby of Australia. "In those three situations when three guys fell in front, I managed to get around but then ended up getting passed," he said. "It's just one of those things, the safest place is out in front and when you've got the current Olympic champion and the world champion in your moto, it is a tough feat to do." The last four years have been a see-saw in terms of injuries for Nhlapo, as he had to recover from a neck injury - fracturing two vertebrae in 2009 - and reconstructive knee surgery last year. "I can't thank everybody enough for supporting me up to this point and sorry I couldn't make you guys proud," he said. "I'm just going to take some time off, let the body heal. "I've really pushed my body hard just to get to this point with the injuries I've sustained over the past two years and I think it is just time to have a good rest and have a proper recovery and focus on the next four years." Nhlapo said he would turn his focus to the 2016 Rio Games after his break. "I still have another four years still in me... I am only 25, a BMX rider lasts roughly till 32 so I think I've got a good six years left in me," Nhlapo said. He added that South Africa had to invest more in the sport as the rest of the field were much better prepared. "At this Olympics alone we have three countries that had built replica tracks like this at their Olympic training centres," he said. "I think South Africa has a long way to go in terms of producing future champions and future Olympians and hopefully they can pick up the pace and learn from what the other countries are doing." 1. Raymon van der Biezen, Netherlands, (37.974, 1; 38.269, 1; 38.392, 1) 3 (Q). 2. Edzus Treimanis, Latvia, (40.130, 4; 52.014, 6; 38.572, 2) 12 (Q). 3. Quentin Caleyron, France, (42.560, 7; 41.336, 5; 1:04.609, 5; 39.162, 1; 38.489, 1) 19 (Q). 4. Khalen Young, Australia, (DNF; 39.189, 2; 39.456, 3; 39.484, 2; 1:04.756, 4) 19 (Q). 5. Morten Therkildsen, Denmark, (40.789, 6; 39.788, 4; 39.896, 4; 40.160, 4; 39.104, 2) 20. 6. Emilio Andres Falla Buchely, Ecuador, (39.602, 3; DNF; 1:31.130, 6; 39.756, 3; 41.793, 3) 23. 7. Kurt Pickard, New Zealand, (40.200, 5; 39.539, 3; DNF; DNS; DNS) 31. 8. Renato Rezende, Brazil, (38.343, 2; DNF; DNS; DNS; DNS) 36. 1. Connor Fields, United States, (37.721, 1; 38.352, 1; 38.025, 1) 3 (Q). 2. Liam Phillips, Britain, (38.072, 2; 38.625, 2; 38.301, 2) 6 (Q). 3. Andres Eduardo Jimenez Caicedo, Colombia, (38.753, 4; 39.208, 3; 38.865, 4; 38.581, 1; 44.026, 5) 17 (Q). 4. Rihards Veide, Latvia, (39.489, 6; 39.403, 4; 38.594, 3; 39.508, 4; 39.110, 2) 19 (Q). 5. Tory Nyhaug, Canada, (38.610, 3; 1:03.089, 7; 39.949, 6; 39.503, 3; 38.808, 1) 20. 6. Moana Moo Caille, France, (39.191, 5; 39.547, 5; 39.512, 5; 38.705, 2; 1:30.608, 6) 23. 7. Jelle van Gorkom, Netherlands, (39.691, 7; 1:37.787, 8; 42.695, 8; 40.419, 5; 40.096, 3) 31. 8. Maik Baier, Germany, (40.558, 8; 56.453, 6; 40.541, 7; 46.131, 6; 41.109, 4) 31. 1. Marc Willers, New Zealand, (44.875, 1; 38.879, 2; 38.467, 1) 4 (Q). 2. Joris Daudet, France, (57.529, 4; 38.789, 1; 38.644, 2) 7 (Q). 3. David Herman, United States, (DNF; 39.400, 3; 39.373, 4; 38.319, 1; 39.005, 2) 18 (Q). 4. Roger Rinderknecht, Switzerland, (54.108, 3; 39.887, 5; 39.209, 3; 39.844, 4; 39.453, 3) 18 (Q). 5. Nicholas Long, United States, (1:46.734, 7; 39.533, 4; 39.379, 5; 38.383, 2; 38.428, 1) 19. 6. Ernesto Pizarro, Argentina, (1:20.748, 6; 40.179, 6; 39.905, 7; 38.799, 3; 40.141, 4) 26. 7. Manuel de Vecchi, Italy, (53.365, 2; 41.499, 8; 50.745, 8; 40.905, 6; 40.261, 5) 29. 8. Daniel Caluag, Philippines, (1:02.086, 5; 40.750, 7; 39.902, 6; 40.342, 5; 40.380, 6) 29. 1. Twan van Gendt, Netherlands, (38.094, 1; 38.190, 2; 38.402, 4) 7 (Q). 2. Maris Strombergs, Latvia, (38.359, 2; 40.353, 5; 37.738, 1) 8 (Q). 3. Sam Willoughby, Australia, (40.250, 4; 37.856, 1; 38.200, 3; 38.840, 2; 59.499, 6) 16 (Q). 4. Carlos Mario Oquendo Zabala, Colombia, (DNF; 39.148, 4; 37.976, 2; 1:23.505, 6; 38.167, 1) 21 (Q). 5. Luis Brethauer, Germany, (43.391, 6; 39.108, 3; 39.435, 5; 40.134, 4; 38.973, 4) 22. 6. Arnaud Dubois, Belgium, (40.179, 3; 51.285, 8; 40.003, 7; 39.564, 3; 38.620, 3) 24. 7. Brian Kirkham, Australia, (59.988, 7; 48.026, 7; 40.519, 8; 38.158, 1; 38.475, 2) 25. 8. Sifiso Nhlapo, South Africa, (41.773, 5; 40.539, 6; 39.653, 6; 40.377, 5; 39.835, 5) 27.